Rhythm & Blues entertainer Movin’ Melvin Brown takes us on a Black Music journey (50s-90s). A LIVING LEGEND. Not to be missed! 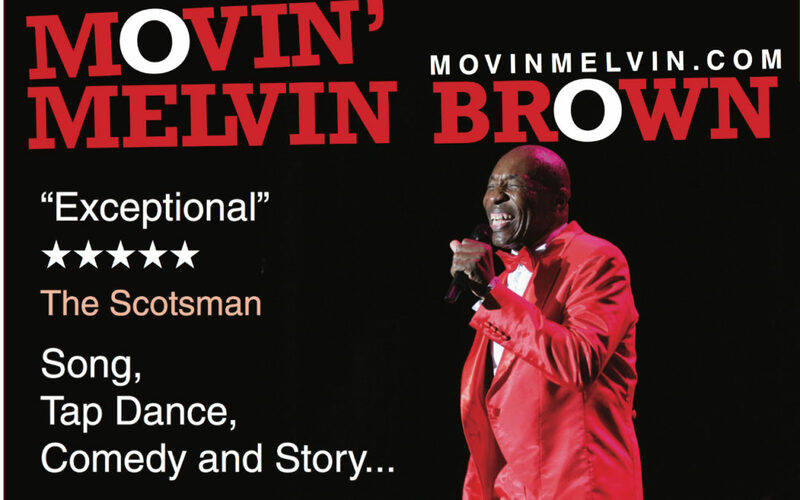 Multi-award winning entertainer and Rhythm ‘n’ Blues legend Movin’ Melvin Brown will take you on a Musical journey (50s-90s) through his incredible life in song, dance, tap dance, comedy and true stories! Described as ‘The last of the great Song and Dance Men’, his award-winning entertainment career spans 5 decades of singing, tap-dancing, storytelling and laughing with the best. Songs of Sam Cooke, Ray Charles, Otis Redding, The Temptations, Platters and more! Featuring characters like the Black Preacher, the Music Box Dancer, Bojangles, James Brown… and Tap dancing to different styles of music, including an amazing and high-energy routine to Michael Jackson’s music ‘Jam’! The show has sold out in Edinburgh, Edmonton, Vancouver, Adelaide and many other Festivals around the world, earning several awards including ‘Audience Pick’ for best show in Toronto and Vancouver, ‘Outstanding solo Performer’ in New York and Ottawa, ‘Best international Act’ in Brighton UK, and more. Born in Cincinnati, Ohio, he has been at the heart of the black music scene since he started stealing hearts with his dancing aged five. He had a doo-wop group as a teenager, when Cincinnati was the hub of black music, and has worked with the likes of James Brown, BB King, The Isley Brothers, Little Stevie Wonder and many more. Right now Brown’s own single Love Stormy Weather is in the UK soul charts and is available on a 45 vinyl.